Weak sunlight filtered through the trees, shining on the two grubby men by the fire. Neither appeared rested – both had bloodshot eyes underlined by dark shadows and stubble on their chins. Heyes stirred the coals and looked sideways at his partner, who looked sourly back at him. “That’s what, Heyes, crazy?” the Kid asked, glaring dangerously at his partner. “The way she looked at us! That’s it?! That’s why I got dragged out the back door of the saloon before I could even get a drink; that’s why we rode half the night?! Because you didn’t like the way she looked at us? !” Heyes threw up his hands and looked to the heavens as his voice rose. “Yeah, Heyes, it was the way she looked at us. I’ve seen enough bounty hunters lookin’ at us to know what that look means,” the Kid shot back, his voice also rising. “You’re getting too jumpy, Kid. She was a nice lady – well dressed and staying at a good hotel. So we’re on the trail again, all because you’re leaping to conclusions about the way a nice lady looked at us,” Heyes growled. The two sat in silence, glaring at each other and finishing their coffee. “Now who’s leapin’ to conclusions?” the Kid asked, smiling slightly, as he set about packing up his gear. As soon as they had gone, a woman stepped from behind the bushes that had been concealing her. She put her gun back in its holster. “Toadsuck, hmm.” She smiled and left. As they rode into Toadsuck, Heyes and the Kid looked carefully around at the dusty street. Their shoulders relaxed slightly as they ambled along the main, and only, street in the town. “You keep tellin’ me and I keep not believin’ you,” the Kid muttered. “Sounds good, but maybe I should wire Mac before the four or five drinks – hate to think what I’d say afterwards,” Heyes chuckled in response. They pulled up to the hotel, dismounted, and entered. A considerably cleaned-up Hannibal Heyes and Kid Curry walked down the hall towards their room. As they walked, they were laughing and counting money. “I’ll wait to wire Mac, maybe we can win enough we won’t need to bother him,” Heyes agreed. They laughed as they entered the dark room. Heyes shut the door and began to remove his gun belt as the Kid lit the lamp. A dark figure rose from the chair behind them, her silhouette indicating that she was armed. Heyes and the Kid glanced at each other, grimaced, and did as instructed. The woman speaking was pretty and holding a very business-like Derringer. As they got a good look at her, their eyes widened. Heyes briefly closed his eyes before returning his attention to the gun pointed at him. They sat on the edge of the bed. 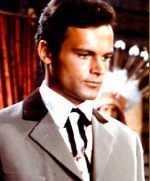 It was Heyes’ turn to glare at the Kid. The two stood up simultaneously and started edging to different sides of the room. “Back together, please, and SIT DOWN!” She emphasized her order with her gun. The two sat side by side. “Of course, it’s Mel, Melanie Duster.” While she spoke, she reached up and casually tore the shoulder of her blouse and pulled several strands of hair loose from her braid. “What you do that for?” the Kid asked. “Alright, Mr. Heyes, please tie Mr. Curry’s hands to that bed post over there. I’ll be checking them so make sure they’re good and secure.” Heyes gave her a look; she cocked her pistol; Heyes took the thongs she threw to him and tied the Kid to the bedpost. “It’s just Heyes,” he muttered as he did as she instructed. “So, darlin’…” began the Kid. “Well, won’t that be cozy,” Heyes grumbled. “So, Miss Duster, how did you decide to become a bounty hunter? You have to admit it’s a pretty unusual occupation for a lady such as yourself.” Heyes looked up at the woman sitting beyond reach of their feet in a chair placed between the two beds. “Why did you become an outlaw, Mr. Heyes?” Mel countered, with a slight smile. The Kid appeared to be slumped against his bound hands, dozing, his head moving as he breathed. Mel looked at them somberly and nodded. Heyes and the Kid, heads down and with grim expressions, walked slowly across the street towards the sheriff’s office. Mel followed closely behind them. The two looked at each other and kept walking slowly. Suddenly, the sheriff appeared up the street running towards them. “No time!” he interrupted again, tugging on her arm. Heyes and the Kid stopped and looked on. Mel planted her feet firmly and shook off the sheriff. “Go ahead, Miss Duster, no need to hurry on our account.” Heyes smiled at her. They both grinned slightly and went in front of her, following the sheriff. 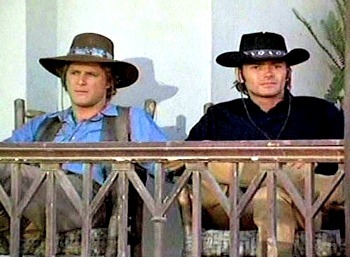 The sheriff, Heyes, the Kid, and Mel entered the office. The mayor was standing holding his wife, who was weeping and being comforted by her husband. “Mel! It’s about time you got here,” the mayor exclaimed as they all came in. He ignored the others, focusing solely on his sister. Hester turned from her husband and fell on her sister-in-law, crying hysterically. Mel stepped back under the impact and sighed impatiently, then patted Hester on the back while looking at her brother. “Oh, Mel,” Hester cried. “It’s Jamie…” She broke down again, weeping. Throughout this exchange, Heyes and the Kid had been standing in the corner ignored. They looked at each other and began to sidle to the door. “Don’t go anywhere,” Mel exclaimed as she saw them approach the door. Suddenly, everyone was looking at them. “Who are you?” Robert asked. “I’m Joshua Smith and this is my partner, Thaddeus Jones. We had some business with Miss Duster, but we can see you’re all busy. We won’t take up your time at this sad occasion, so we’ll just be moving on,” Heyes responded. They looked at her, eyebrows raised and brows furrowed. “Really, this is family business. We’d just be intruding,” Heyes continued, and the two sidled closer to the door. “Let me talk to them in private for a moment,” Mel replied. “How do we know you’d keep your word?” Heyes asked. The Kid looked skeptical. “Do you have a choice? The sheriff’s right there,” Mel countered. “Can’t let the boy come to harm.” Heyes shrugged. “No, no, that would be terrible,” the Kid agreed. “You have our word.” They both held out their hands and shook Mel’s. “They took him from his room!” exclaimed Hester, before she broke down in tears again. Heyes sighed contentedly and pushed back from the table while holding his coffee cup out for a refill from the obliging waitress. Once she had left, he looked at his companion who was still steadily eating. “It’s good, and I never know when I’m goin’ to get a good meal, do I?” The Kid mumbled around a mouthful of biscuit and bacon. Mel entered the café, looked around, stalked up to their table, pulled out a chair, sat down, and exhaled loudly. “We gave you our word, ma’am,” the Kid said, glowering at her then turning back to his meal. “Thaddeus here is real particular about starting the day with a good breakfast,” Heyes explained. Heyes rolled his eyes but said nothing, nodding at Mel to continue. “So maybe these kidnappers convinced him he wanted to go with them,” Heyes speculated. “I suppose,” Mel murmured, eyebrows raised. Before she could say anything else, the sheriff burst into the mostly empty café and hustled over to their table. “Miss Mel, Mr. Jones, Mr. Smith,” he started. “Miss Callie over to the dry goods said that Miss Novak the school marm said Mr. Humphrey the dentist – though I wouldn’t go to him less’n I was desperate if I was you, he’s also the undertaker – anyways, Mr. Humphrey told her that Henry the blacksmith spoke with Doc Johnson who said that there were two men he played poker with a few nights ago that he saw talking to Jamie back of the livery stable yesterday.” He paused to draw breath. “Anyway, Rev. Carson said that he saw these two down to the creek camping. But no one has seen them today and I went down there and there’s no one camped there, at least not now. So I was thinking you might want to look at their old campsite by the creek,” he ended triumphantly. 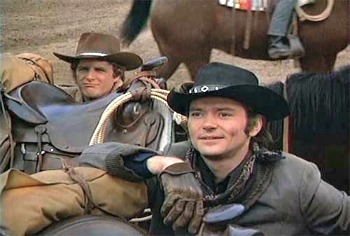 Two cowboys sat by a campfire in a hollow among some large boulders. There were numerous bushes and a few trees in the area and the sound of rushing water in the background. It was an isolated spot. “Hands up, ya low-down thievin’ varmints!” a voice suddenly rang out. Bill and Sam instinctively put their hands up while they looked around for the source of the orders. “Hah, I got you good that time,” a dusty ten-year-old chortled as he leapt from behind some boulders. Bill and Sam lowered their hands, looking sheepish. Sam interrupted, “It’s just that it takes some time to get word to them, but don’t worry, they’ll be here in a few days; you can count on that.” He reassured the boy while glaring at Bill. “Well, if I find out you’ve lied to me, you’ll be sorry,” Jamie pouted. “My aunt’s a bounty hunter, you know,” he added conversationally. “Let’s play hide-n-seek,” Jamie demanded, distracted. “I’ll hide and you two count to one hundred, then try and find me,” he instructed, running off. Bill and Sam rolled their eyes but began to count loudly. Heyes knelt down while the Kid looked over his shoulder. After a moment, he looked up at the Kid and stood, turning to the sheriff. “What do you mean?” the sheriff asked. “Hey, I was the champeen tracker of all southern Utah, you know,” Heyes protested. “Fresh two-week old tracks?” the sheriff repeated, scratching his head. Heyes, the Kid, and Mel examined the ground under Jamie’s window. “Well, that could be Jamie’s footprint there, so they didn’t carry him. But can either of you find any other tracks?” Mel asked. Hester rushed out of a room and again threw herself into Mel’s unwilling arms. “Ma’am, if we could just take a brief look, we might find something useful to help us track these men.” Heyes took off his hat and nudged the Kid, who did the same. Heyes and the Kid’s lips twitched briefly as they glanced surreptitiously at Mel, who was glaring at her sister-in-law during this speech. “Ma’am, your son’s room,” the Kid prodded. She led them into the small bedroom, which was messy and cluttered with string, nails, seed pods, a small animal skeleton, snake skins, a bird’s nest, marbles, a sling shot, and various books and dime novels – all the detritus left behind by a bright, young boy. The boys smirked slightly. Mel rolled her eyes. The smirks quickly vanished and slight frowns appeared. “Hester, you’re sure he was kidnapped, that he didn’t just run off or this isn’t some game Jamie is playing?” Mel asked. “Oh, do you think it could be?” Hester’s face lit up, then crumpled again and tears began to form. “No, I don’t see how it could be; the note isn’t in his handwriting, and he’d be back by now if he ran off, I just know he would. Something terrible’s happened to my Jamie!” She began crying again. The three looked on helplessly, until Mel gently patted her back and led her out of the room. “Doc, we have some questions for you,” Mel announced as she strode briskly into the doctor’s office, Heyes and the Kid on her heels. “You think they had something to do with this? Terrible.” He shook his head and dropped into a reverie. “Doc, can you describe the men to us? Did they give names or anything?” Heyes prodded. Mel, Heyes, and the Kid looked at each other. “But did they say anything that might be helpful?” Mel asked. The Kid grunted and glowered at the description of a gunslinger, but said nothing. Heyes looked at him, eyebrow raised, and mostly suppressed a smile; even Mel’s lips twitched at his reaction. The three took their leave. Bill and Sam, now mud-spattered and disheveled, sat wearily by the campfire looking at the sleeping Jamie. Sam’s right eye was rapidly blackening and both bore numerous scratches. Although covered in a layer of dirt, Jamie asleep looked young, innocent, and vulnerable. “Sam, don’t leave me alone with him, please,” Bill begged. Both looked at the sleeping boy and sighed. 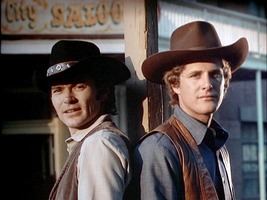 Mel caught up to Heyes and the Kid just as they were about to enter the saloon. “Where do you two think you’re going?” she stormed. “You’re just trying to slip out of town. I knew I shouldn’t have trusted you,” she fumed. The Kid glared at her. “He told you; we keep our word. Now, I am goin’ into that saloon and gettin’ some drinks. If you don’t like it you can come too, but don’t blame us if the other men in there misunderstand your intentions. We ain’t rescuin’ you.” He turned and walked away. 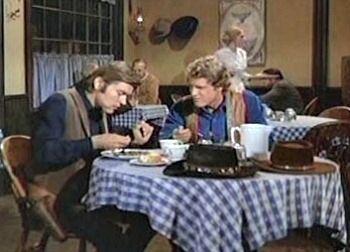 Heyes strode into the saloon after the Kid. “Suit yourself, Sweetheart; we’ll know where to find you in the morning,” he shot over his shoulder. In the slender light of dawn, Heyes and the Kid spoke quietly as they tacked up their horses. They mounted and prepared to head out. The two stopped and looked at each other. The three rode along – Heyes and Mel in the lead, the Kid behind keeping a watchful eye on the countryside. “We’re not all alike, you know,” the Kid said gently. They looked where she pointed, then grimaced to each other as they reached the well and looked around. “No cover,” the Kid said. “Let me think a minute, Kid.” Heyes dismounted and thrust his reins into the Kid’s hands while he walked away, pushing his hat back as he walked. Mel and the Kid watched while Heyes paced and paced. He stopped, looked at the well then back towards town, shook his head, and resumed pacing. “It’s too bad your fiancé left, but you’re better off without someone who won’t stick around when times are hard,” the Kid commented to Mel as they watched Heyes pace. “I don’t want your pity,” she snapped. Heyes ignored her and hauled a bucket of water up, which he then poured on the ground around the well. The Kid watched for a minute; then he hauled up the next bucket and poured that out as well. The Kid continued to haul buckets and splash them on the ground where Heyes indicated, while Mel watched, her eyes narrowed, and an exasperated expression on her face. “What are you two doing?” she finally asked. Mel glared at them then held out her hand for the bucket, filled it, and poured it on the ground. The three rode up to the church and halted. Mel was rubbing her hands. The Kid watched her. “Bring gloves when we go back this afternoon,” he suggested. “We’re gonna have to pour more water out again, you know,” he smirked at her. She rolled her eyes, dismounted, and went to knock on the door of the parsonage, next to the church. Bill’s eyes opened wide and his lips pursed; he glanced back at the path towards Toadsuck. “Only if you promise no scalping,” he replied. “I promise,” said Jamie, crossing his fingers behind his back and smiling. “…ninety-eight, ninety-nine, one hundred.” Bill looked up from the tree where he was hiding his eyes while counting. He now sported a bandage wrapped around his head. “Okay, kid, I’m gonna find you, then I think we’ll try some roping, with you as the dang calf to be hog-tied,” he muttered to himself. Bill looked around, his attention caught by a clump of bushes that was gently swaying. “Got ya,” he whispered and crawled into the bush. Almost immediately he backed out rapidly, coughing and sputtering. “Watcha doin’, Bill?” Jamie asked, walking up behind him. Bill spun wildly, his eyes and nose streaming, muttered incoherently, ran to the stream, and began splashing water on his face. Then he shoved his whole head into the stream, holding it there as long as he could. “Oh, yeah, guess I won again,” Jamie replied. He wandered over to look at the bushes Bill had exited so rapidly. “Uh, oh,” he said. “Nothing, it’s just… You didn’t crawl that way, did you?” he asked, pointing through the bushes at an angle. “Come on, we gotta move on to where we’re gonna meet Heyes and the Kid. Sam’s gone to fetch them, remember?” Bill growled, as his hands clenched and unclenched. Heyes and the Kid were sitting on the hotel porch, their feet on the railing watching the street. Mel and her brother came striding up the street, climbed the steps, and walked over to the two men. The Kid pushed his hat up and looked at them. “Mornin’,” he greeted them. “I left a note like he said. Didn’t see anyone, though,” Robert said. “What did your note say?” Mel asked curiously. “It better work!” Robert fumed at her then stomped off. “Not until then?” Mel began to fume again. The two stood up and walked towards the café. Mel stared after them, then sighed and walked the other way. “That girl sure is excitable,” the Kid remarked to Heyes as they walked away. “Sure is.” Heyes grinned at him. Once again, Heyes and Mel rode in front and the Kid followed, keeping a steady watch on the countryside around them. When they reached the well, Mel dismounted and ran towards it. Heyes and the Kid followed more slowly. “Where did your brother say he put the note?” Heyes asked. They mounted up and headed out, this time the Kid in the lead as they followed the tracks. The Kid rolled his eyes and finished pulling the saddle off his horse. He looked around, put down the saddle, and began to lay out his bedroll. “Stop that! We have to keep going!” Mel exclaimed. Heyes stalked over to the Kid. “Women! Bounty hunters at that!” he expostulated quietly. Mel stared hard at him, turned, and began untacking her horse. 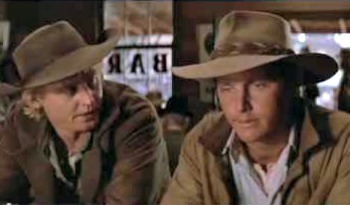 Heyes watched the Kid and Mel stare at the ground as they held their horses with one hand and gesticulated with the other. The two were arguing. The two turned to him. “Look, these are the only tracks we see, so I suggest we follow them. They take the right fork. We’ll follow that for one hour and, if we don’t see anything then, we’ll turn back and try the left fork. Either way, we have a better chance of finding Jamie if we GET MOVING!” He finished loudly, then stopped and smiled sweetly at them. Mel opened her mouth, caught his glare, and closed it again. She mounted her horse. Heyes and the Kid did the same, and all three moved off down the right fork of the trail silently. “Kid, can you see anything?” Heyes called to the Kid who was in the lead and looking intently at the ground before him. “Yeah, I’m pretty sure we’re gettin’ closer, so we might want to slow down some. 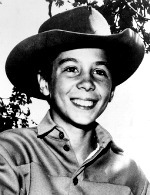 Don’t want to catch him before he gets back to their camp, Heyes,” the Kid called back. They slowed their horses from the quick walk they were using to a slow walk. Mel dropped back so she was riding next to Heyes. “If you don’t want folks to recognize you, why do you use your names so much?” she asked. Heyes looked at her for a moment. “You’re right; we probably use them too often. Maybe it’s habit.” He paused before resuming thoughtfully, “I don’t know, maybe it’s something else. Having lost our families young and now having retired and started out new; maybe using our names is how we hold on to ourselves.” He stopped talking and rode forward to catch up with the Kid. Mel looked after them then shook her head and followed. Bill looked up from the burnt remains smoldering in the fire. “Don’t tempt me, kid, don’t tempt me,” Bill muttered then looked up at the sound of an approaching horse, pulling his gun out. Sam rode up and dismounted before answering Jamie. “Sure, Sam,” said Jamie, running off excitedly. Sam and Bill watched him run off. Heyes, the Kid, and Mel lay on their stomachs looking down at the campsite. Heyes was looking through field glasses. “Jamie’s there alright and he doesn’t appear to be injured at all,” Heyes reassured her, handing her the glasses. He looked at the Kid over her head and nodded back towards their horses. “Think faster, Heyes.” The Kid went slowly back to Mel who was still watching through the glasses. “He ain’t that bad, Bill.” Sam rolled his eyes. At that moment, a large dollop of mud landed splat on his back, followed by several sharp pings as little rocks and nuts pelted the back of his head. “Hey!” Sam shouted, turning around. “Look, I made a sling shot,” Jamie cried, racing up. “Now we’ll have fun.” And he raced off. “Watch me hit that nest!” Jamie shouted. They turned and saw him, about five yards away, launching a rock with the sling shot right at a bee’s nest a little ways behind them. Too late; an angry buzzing filled the air as the nest fell and the sky darkened with bees. Bill and Sam ran for the stream, slapping at the bees as they went, and plunged in, submerging their bodies. Sam and Bill came out of the stream, water flowing off them. Bill’s eye was swelling from the bee stings, and Sam looked as if he, too, had had several encounters with the bees. He stormed over and grabbed Jamie, Sam right behind him. “I’m gonna kill you!” he shouted and began shaking Jamie. A gunshot blasted in the air. Heyes strode into the clearing. “Let him go,” he ordered in his best outlaw leader voice. Bill and Sam whirled around to see Heyes, the Kid, and Mel come into the clearing, pointing guns at them. “We weren’t really gonna hurt him, Heyes, Kid, honest,” Sam stammered, putting his hands in the air. “Even if he is the devil’s spawn,” Bill averred, letting go of Jamie, who appeared completely unharmed and was standing transfixed, staring at Heyes and the Kid. “Just put your guns down over there, boys,” the Kid interrupted. Bill and Sam hastened to comply with the Kid’s orders. “Why are you holding guns on my friends?” Jamie demanded. “No, they didn’t; I came with them so I could meet these two.” Jamie danced around Heyes and the Kid. “Can I be in the gang, can I, can I? I’d be real good at it. I can get into and out of anything,” he boasted. “Yeah, Jamie, we know she’s a bounty hunter,” the Kid stated. Bill and Sam paled at the news and began to edge out of the group. “You’re not going anywhere, you two.” Heyes called them back, using his gun to indicate where they should stand. “Really, we quit,” the Kid confirmed. “There’re times when it can be exciting I admit, but it’s not much fun being chased by posses and getting shot at all the time. And Devil’s Hole is a really boring place to spend your time,” Heyes assured him. Jamie listened to him then searched first his and then the Kid’s faces. “I guess you’re telling me the truth,” he said, shoulders slumping. Heyes and the Kid nodded; Mel looked thoughtful. Mel, Heyes, Bill, and Sam watched the Kid and Jamie head off then Bill and Sam turned to Heyes. Bill and Sam looked down and dug patterns in the sandy ground with the toes of their boots. Bill looked beseechingly at Heyes. Sam frowned slightly then smiled. “I don’t think we are, lady. 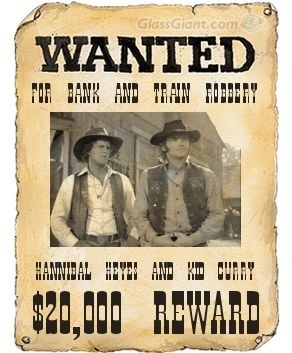 How are you going to explain riding with Hannibal Heyes and Kid Curry? Or are you planning to turn them in when we get to town and claim the reward on them, too?” He carefully didn’t look at Heyes as he spoke. Bill’s eyes widened and he opened his mouth then shut it as Sam stomped on his foot. Mel looked at Heyes. “No, just no.” She walked away. Jamie wiped his mouth with his sleeve and sighed. Mel picked up the last corncake and broke it in half, offering the other half to the Kid before consuming her piece. “Dishes!? Just because I am the only woman here does not mean I do the dishes,” Mel exclaimed angrily. The four men watched them leave. “Okay, boys, get out of here,” Heyes stated quietly. Sam reached into his pocket and pulled out the two hundred dollars. The Kid took it, leaned over, gave them fifty dollars back, and pocketed the rest. “What was that about?” Sam demanded angrily. “The price of bein’ delivered from sin. Use that money to get to Hiram’s. It won’t come so cheaply next time we have to save your sorry necks,” the Kid responded coldly. Sam and Bill looked at each other, then at Heyes and the Kid glaring at them, and gulped. They gathered their horses. “Say, if you’re ever in California look us up at Hiram’s. Hope we see you again, Heyes, Kid.” They quickly mounted and loped away. “Not if we see you first,” the Kid muttered. Heyes and the Kid watched them ride off then turned as Mel and Jamie came up from the stream. “Hey, they’re getting away!” shouted Mel. Jamie was mounted behind Mel on her horse. The Kid and Heyes were also mounted. “You can’t do that, Jamie,” the Kid responded. Jamie and Mel urged their horse towards Toadsuck. Heyes and the Kid watched them go. “Hmph.” The Kid grinned. “Too late now; guess we’ll just have to keep it.” Heyes grinned back and the two loped off in the opposite direction from Toadsuck. 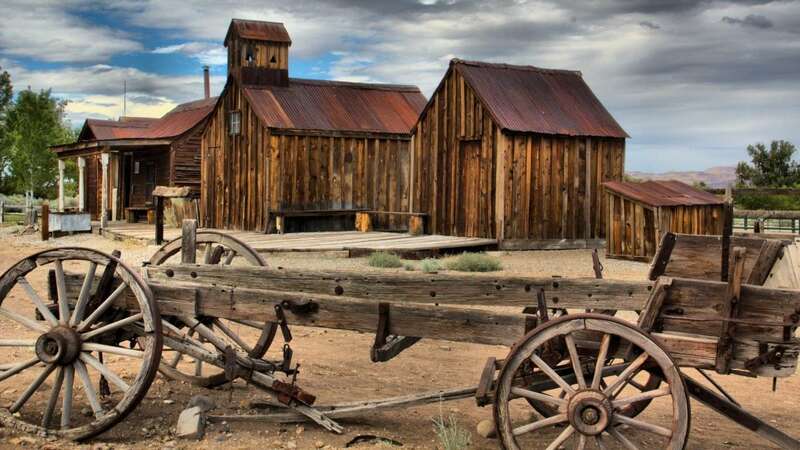 Author’s note: According to the Texas State Historical Association, in 1869, a town was surveyed (and incorporated) next to the existing Toadsuck Saloon, from whence the town got its name. In 1880, the Texas and Pacific railroad built a line about a mile outside of Toadsuck, and by 1887, most of the population and businesses had moved over by the rail line. That new town was named Collinsville and incorporated in the 1890s. The current town of Collinsville, Texas, encompasses the land where the town of Toadsuck and the Toadsuck Saloon used to stand. Frederick O. Vaille was the founder of the Denver Dispatch Company, which began telephone service in Denver in 1879 with 161 customers. It was the 17th telephone exchange to open in the United States and was one of the largest.